Preaching the Atonement explores some classic texts which throw light on the atonement. Each chapter focuses on a key Biblical passage, offering a theological commentary which will help both preachers and church members gain a deeper understanding of the atoning work of Christ. Each chapter contains a sermon on the chosen text, illustrating how these themes may be communicated to contemporary congregations. Seeking to be sensitive to the literary forms of the chosen texts, these sermons employ a range of homiletical strategies. The sermons are drawn from the works of preachers on both sides of the Atlantic. Preaching the Atonement assumes that the preacher's role is not to squeeze every passage of Scripture into the same mould. Each passage bears witness to another aspect of the many splendored work of Christ; as the preacher invites the congregation to listen to the testimony of this cloud of biblical witnesses. 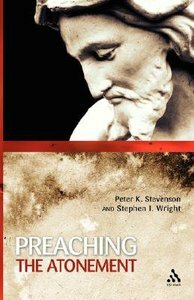 The authors explore a variety of ways in which the Christian doctrine of the atonement, God's act of making humanity one with himself in Christ, may be presented in contemporary preaching. We are delighted to announce that this book has been short listed for the prestigious Michael Ramsey prize for the best in theological writing. For more information please visit: www.michaelramseyprize.org.uk Preaching the Atonementexplores some classic texts which throw light on the atonement. Each chapter focuses on a key Biblical passage, offering a theological commentary which will help both preachers and church members gain a deeper understanding of the atoning work of Christ. Each chapter contains a sermon on the chosen text, illustrating how these themes may be communicated to contemporary congregations. Seeking to be sensitive to the literary forms of the chosen texts, these sermons employ a range of homiletical strategies. The sermons are drawn from the works of preachers on both sides of the Atlantic. Preaching the Atonement assumes that the preacher's role is not to squeeze every passage of Scripture into the same mould. Each passage bears witness to another aspect of the many splendoured work of Christ; as the preacher invites the congregation to listen to the testimony of this cloud of biblical witnesses. Peter K. Stevenson (PhD) has been overseeing the running of the MTh in Applied Theology course at Spurgeon's College since 1995. Before joining the staff team he had served for 17 years as a Baptist minister in Bedford, Shirley (Solihull) and London.